This promo recipe was clipped from packaging of some kind and found in a large collection, date unknown. I’ve typed it below along with a scanned copy. Dissolve gelatin in boiling water. 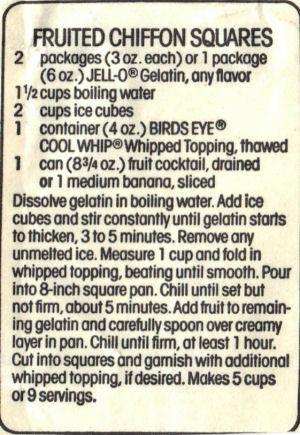 Add ice cubes and stir constantly until gelatin starts to thicken, 3 to 5 minutes. Remove any unmelted ice. Measure 1 cup and fold in whipped topping, beating until smooth. Pour into 8-inch square pan. Chill until set but not firm, about 5 minutes. Add fruit to remaining gelatin and carefully spoon over creamy layer in pan. Chill until firm, at least 1 hour. Cut into squares and garnish with additional whipped topping, if desired. Makes 5 cups or 9 servings.